On Thursday night I had planned to run out for 6-7 miles with the club but after a phone call asking for yet more details about our house for the sale (details we have already specified at least three times! ), and a traffic jam meaning that Dan had been driving in the hot weather for well over two hours, he wasn’t feeling too jolly, so I cheered him up by suggesting a run to the new pub that has recently opened in the next village to us. We got our running gear on, packed a £10 note int0 our pockets and took an easy 5k jaunt off-road until we reached the beer garden where we sat back and enjoyed our well-earned pints! Having not yet had any tea we decided it was probably best to walk the return journey. I’m not sure a 5k run in the heat, followed by a sit down in the sun and filling my belly with alcohol was the best recipe for a return run home! The week before half term HMI were in school to observe how the school was getting on. One of my lessons was observed, although only through the panel in the door looking into the room (bizarrely?!) Then, the first week back after half term as part of a departmental review I was observed once more. This time teaching a year 8 lesson where I was graded as ‘good with outstanding features’. The lesson had gone really well so I was happy with the result. I hadn’t made any special arrangements for the lesson, it was purely what I would have taught to that class anyway so I feel happy that a good with outstanding is what I am capable of delivering day to day. On Monday just gone I was observed for a third time. This time it was my appraisal observation. Once more I was graded as good with outstanding features. This obviously called for a celebration. Some people may celebrate with cake, or wine. I celebrated by booking in to the Grim Reaper 70m. Yep, that’s right, – I’m back for take two this July. Watch this space!!! This morning Dan and I headed over to test out the Corby parkrun route. All parkruns are about 30 minutes away from where we live, but as the other runners from my club tend to head to Northampton, that has been where we have headed in the past. This morning Dan and I fancied a change. Northampton is great – a fast, flat course, but insanely busy and often with more than 300 runners showing up. Time for a change. 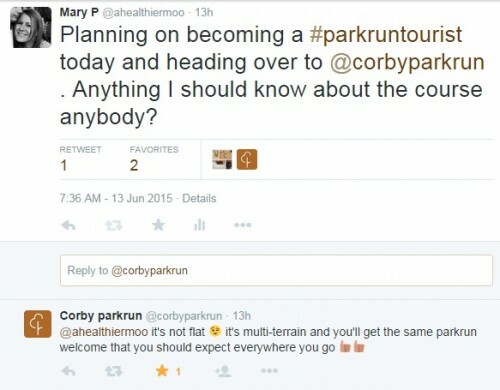 I’d heard good things about Corby parkrun. Primarily that it was offroad and a little hilly. My favourite combination! The weather was a little wet, but still warm. Somehow the rain was very cold though, so when we arrived super early at the start, Dan and I sheltered under the pavillion until it was time to head to the start line. We were given a good run down of the course in the briefing. The run began in the middle of the park and the parkrun was to be two and a half laps before finishing just 200m from the start line. Runners didn’t seem to be closing in at the start and so I wished Dan luck and pushed forward to nearer the front of the queue of runners. There were less than 100 runners there in total (91). I shot off when the run started, gaining a few places immediately. Unlike Northampton I didn’t have to fight for a place on the path. I ran single file the entire way (unless I was overtaking). My heart rate jumped straight up and was in the 190s. I had aimed to run a steady 165-170bpm race, not knowing the course or quite what to expect. I knocked my pace back a bit and let a few runners overtake me until it settled into a rhythm again. Once we reached the top of the field we circled to the left and ran along a path which had several roots growing through with tarmac broken in several places. Some runners ran on the grass, but the grass was wet and freshly cut so I decided to stick to the paths where possible throughout the course – especially during the turns. As we reached the bottom of the park I can remember thinking ‘fairly easy, just two more laps to go!’ We were directed to the right of some trees and into an open field. I passed a couple of runners here and as we reached the end, looked up to see a sharp climb onto the pavement above us. ‘Ah, so that’s why it’s classed as hilly!’ I used my arms to power me up. Then we turned into some woods and climbed another, only slightly less hilly, climb before heading back out onto the grass. Those hills were well concealed from the start! Then through another section of trees and along a lovely short downhill where I let my legs pick up the speed and carry me both times I came through. Back past the top end of the course and along the broken pavement once more. As I reached the bottom of the field for the second time I heard the front runner coming up behind me, turning off through the middle of the park just before he reached me. I shouted out ‘Well done’ from the sidelines as I continued on my last lap. There was a young child infront of me. About 7-8 years old. He ran a great race, pushing on as we reached the bottom of the field once more to collect some water before finding his place in the pack again. I overtook him before ploughing up the steep hill for the second time and didn’t see him again until I cheered him on through the finish. My watch beeped at three miles with what looked like a fair way still to go but I decided to push it from the beep, other than the tight turn on the wet grass to head towards the finish. I was breathing hard, but still feeling comfortable. I think I’m getting the hang of this pacing malarkey now! As soon as I finished, I grabbed my token before ducking out of the funnel to head back and cheer Dan through the finish. Dan was actually not long after me and he put in a fabulous sprint finish to cross the line in 29:33. I’d finished not long before in 28:17. Position: 56/91. Gender position: 7/29. Category position: 1/4. First in my age category! As we got our barcodes scanned we could collect a funsized chocolate. 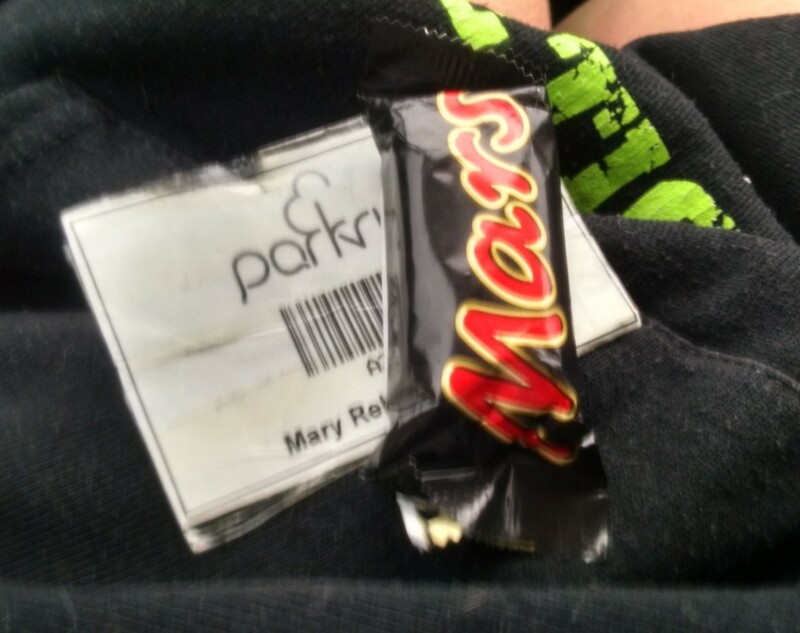 I went for the mars bar. After parkrun, Dan and I both showered and changed before heading out to the cinema for Jurassic World. I’m rubbish at reviewing films without giving anything away, but I thought it was very good. Definitely worth a watch. Loved that there were several references made to the original film as well. Now, I sit binge-watching Orange is the New Black with Dan and madly refreshing the South Downs Way 100 tracker page, as two of our guys from club are running. How are you spending your Saturday evening? Have you been a parkrun tourist before? First in your age category! Awesome work! There are a few more parkruns starting within about 30 min drive of me quite soon, so our club might have an outing to some of them- I am looking forward to trying different ones. I am surprised that you still get graded for lessons- ofsted don’t grade lessons any more and all the guidelines say it is bad practise to do this- especially as teaching includes long term assessments, marking, feedback, communicating with parents etc. But well done on the lessons, and I love your treat to yourself! Thanks, this time, I wasn’t the only one in my age category, so I feel it means more! Haha! I hope that some more parkruns pop up around my parents as they live near to some lovely tracks. Running doesn’t seem to be as big of a thing in Norfolk as it is in the Midlands though, and at least there is one just a 20 minute drive away when I stay at theirs. Apparently it’s for a log to ‘keep track’ on the teachers within the school to ensure everybody is hitting targets. I spoke to a couple of my teacher friends at other local schools after reading your message and they all still get graded as well. Glad my observations are over with for the year! Sounds like a lovely weekend. I’ve only tried two park runs, but keen to try a few more over the summer! 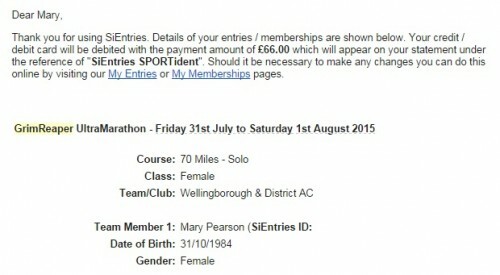 Love the idea of pub running, I definitely need to get my OH into running so I can do that!!! I find parkruns make a lovely start to the weekend and there is a real community feel about them. Pub running is great – you really feel like you earned that pint at the finish! My Saturday night was very boring. Stuck in front of the TV. Well done on being good with outstanding! I’m always far more nervous if I’m being observed. I’m looking at starting Parkruns in the Autumn. I’m probably going for Northampton first as it sounds easier. Northampton is a great first parkrun to try. It is lovely and flat and there are no surprises along the route. There is a great turn out, and I always find I’m under much less pressure the more runners there are out. Good choice! I’m watching orange is the new black as I read this haha! I’ve had to break from it this weekend as Dan is away, but we are a good chunk through the season already, despite being out a lot of nights this week! Nice work on the parkrun! I love going to other parkruns. I’m making it my mission to do different ones. I’ve just found a new one has appeared in North Wales right near my grandparents which wasn’t there the last time I was visiting, which means the next time I go there (sometime this year I imagine) I’ll be able to do it. Apparently there’s a new one happening near my parent’s as well (which is like 15 minutes from me) so that’s cool as well. I think we’re lucky down South to have so many! Jurassic World was a good watch but it was so cheesy, almost laughably so. I did enjoy the nods to the original but it wasn’t nearly as good. A good popcorn movie to enjoy in the cinema but ultimately won’t stand the test of time I don’t think, which is such a shame! I love when new parkruns pop up. The Corby one is relatively new around here, and there are rumours of a few more on their way. Not as many as you guys down South though. Jurassic World was cheesy, I kind of assumed there would be a little. Although I am so glad it wasn’t as cheesy as the third film. That was a bad kind of cheese!